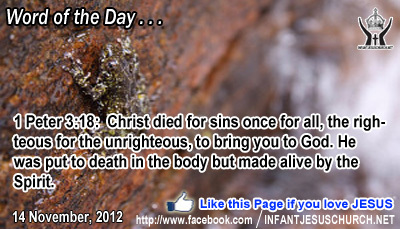 1 Peter 3:18: Christ died for sins once for all, the righteous for the unrighteous, to bring you to God. He was put to death in the body but made alive by the Spirit. Heavenly Father, thank you for the gifts of your grace, Holy Spirit, forgive0ness and life. Most of all, thanks for the gift of your Son Jesus, who brought us life and immortality to life in us through your salvation. Whereas we have no great desire to die, we know we can look through death to you and your success in us through Jesus. Please give us the courage to live for you every day till that day you take us home. In Infant Jesus' name we pray. Amen. 11 On the way to Jerusalem he was passing along between Sama'ria and Galilee. 12 And as he entered a village, he was met by ten lepers, who stood at a distance 13 and lifted up their voices and said, "Jesus, Master, have mercy on us." 14 When he saw them he said to them, "Go and show yourselves to the priests." And as they went they were cleansed. 15 Then one of them, when he saw that he was healed, turned back, praising God with a loud voice; 16 and he fell on his face at Jesus' feet, giving him thanks. Now he was a Samaritan. 17 Then said Jesus, "Were not ten cleansed? Where are the nine? 18 Was no one found to return and give praise to God except this foreigner?" 19 And he said to him, "Rise and go your way; your faith has made you well. The Samaritan came near to Jesus respectfully and gave praise to God. If we do not recognize and understand the mercy shown us we will be ungrateful. Ingratitude is forgetfulness or a poor return for kindness received. ungratefulness easily leads to lack of charity and prejudice towards others. It easily leads to lack of charity and intolerance towards others, as well as to other sins, such as dissatisfaction, displeasure, complaining, grumbling, pride and presumption. How often have we been unappreciative to our parents, priests, teachers, and neighbors? Do we express gratitude to God for his plentiful grace and mercy and are you gracious and compassionate towards our neighbor? Loving Infant Jesus, may we never fail to distinguish your loving kindness and mercy. Fill up our heart with gratitude and blessing, and free us from ungratefulness and discontentment. Help us to count our blessings with a grateful heart and to give thanks in all situations.